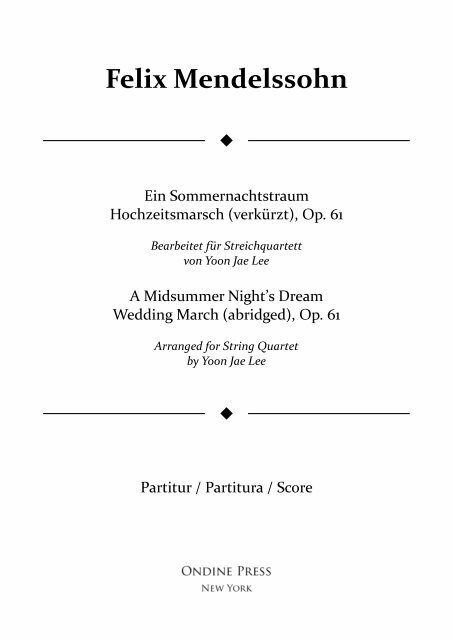 This professionally engraved, high-quality arrangement of Mendelssohn's wedding march for string quartet is offered free of charge as a special promotion courtesy of the arranger (Yoon Jae Lee) and publisher (Ondine Press). This is an abridged version of the march intended for use as a recessional during matrimonial ceremonies. When performing, crediting the author of this arrangement whenever possible would be greatly appreciated. A complete, unabridged arrangement of the entire march will also be available soon.